Today we enter the statistical “shadows”… shine a light through the murk… and illuminate worrying facts. The fed funds rate is the rate at which banks lend to each other overnight… and the rate that now rises to 2%. Thus the world of economics entered a twilight zone where familiar reference points fade… and finally fall away. What if we developed an interest rate model that accounted for quantitative easing’s loosening effects? When the federal funds rate hovers near zero, many economic models stop working. 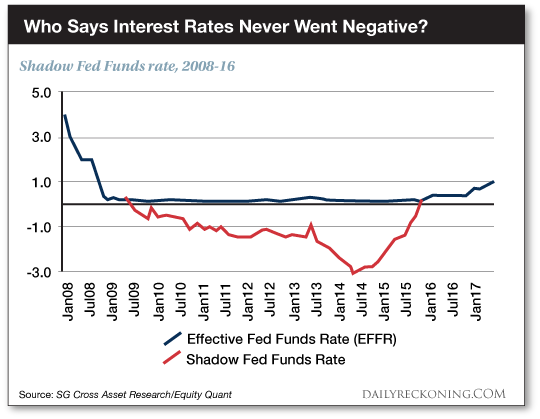 Researchers developed a “shadow rate” that can stand in for the fed funds rate, drop into negative territory and make those models functional again. In mid-2009, after QE 1 entered high gear… the shadow rate turned negative. Here you are — if you follow the official rate’s extended shadow. The shadow rate began a steep rise in late 2014 — over one full year before Janet Yellen raised the actual fed funds rate in December 2015. It converged with the fed funds rate that December… and has matched it in positive territory ever since. And Janet Yellen began jawboning rates higher with “forward guidance” — insinuating that higher rates were on the way in 2015. Thus financial conditions began to bite… and the shadow rate began its rise. 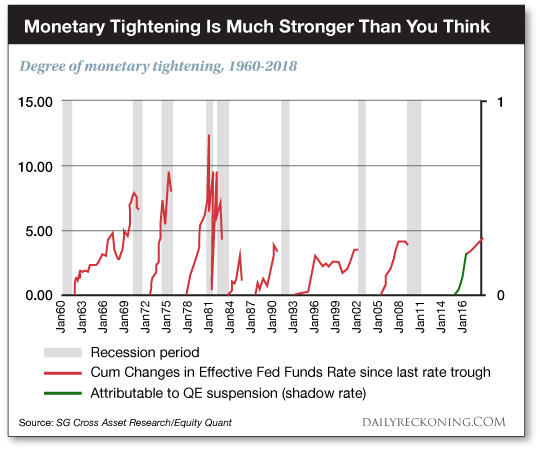 If we therefore consider the shadow rate, the Fed began tightening not in 2015… but sometime in 2014. 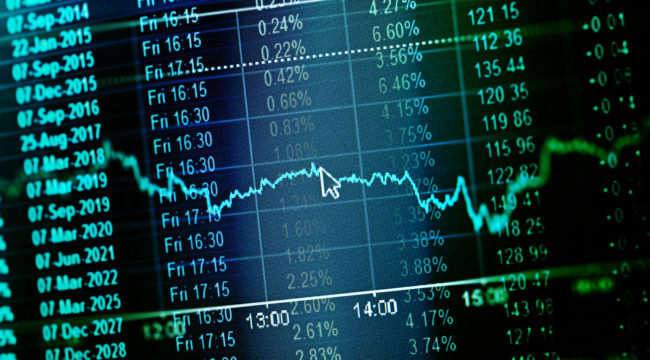 Because the current tightening cycle may be far more mature — and intense — than most realize. But if we account for the shadow rate… the current cycle is nearly four years old. That is nearly 5 full percentage points off its 2014 low — far exceeding the historical average. It is therefore reasonable to argue that the U.S. has already faced a “normal” tightening cycle and any additional rate hikes are taking us into territory not seen in recent times. This already may be enough for the Fed to have broken something.